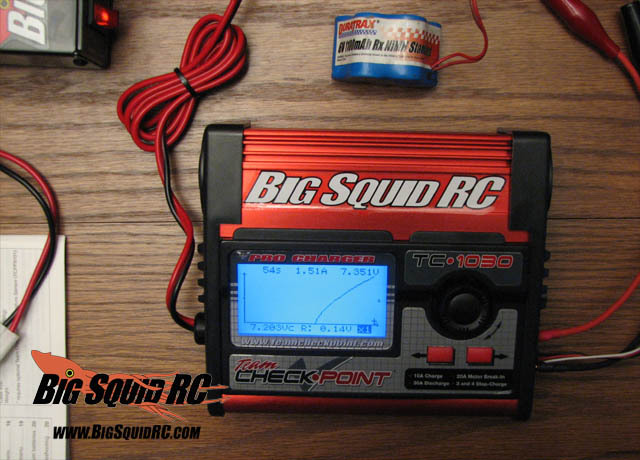 Team Checkpoint TC1030 Pro Charger Review « Big Squid RC – RC Car and Truck News, Reviews, Videos, and More! Team Checkpoint has been making a lot of waves in the RC industry recently, and with the release of the Team Checkpoint TC1030 PRO Charger, you might want to buy a surf board! As a die hard basher, I find myself owning a lot of different types of RC vehicles, and along with that, an amazing amount of different types of batteries. I have 5-cell receiver packs, 6-cell stick packs, and more types/styles of LiPo packs then I can name in this review! That being said, it’s great to have one single charger that can charge them all! 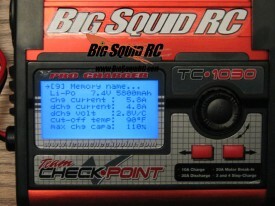 The Team Checkpoint TC1030 is really a next generation charger. There isn’t a battery I could find at Big Squid RC headquarters that it could not charge! 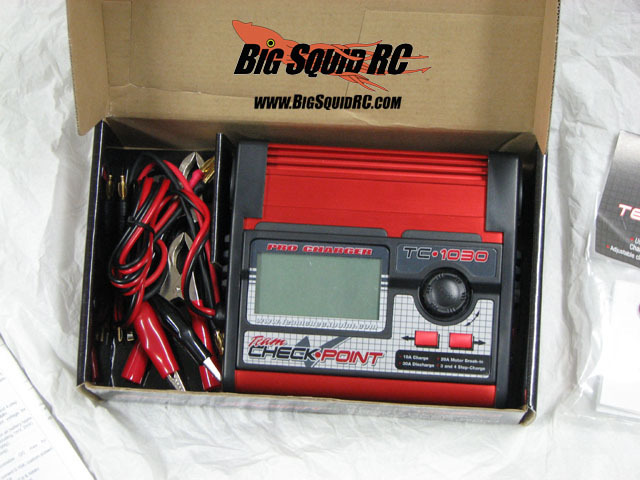 The cost is a slightly more then I would like to pay, it’s about $170 depending on your location, but if you are looking to purchase a charger, do your best to save up for a TC1030, it’s the only charger you will need! The TC1030 came with a nice surprise in the box, a Deans connector wire! I have been doing my best to slowly convert all my batteries to Deans connectors. It does not get any better, and to have all your stuff standard is really great! 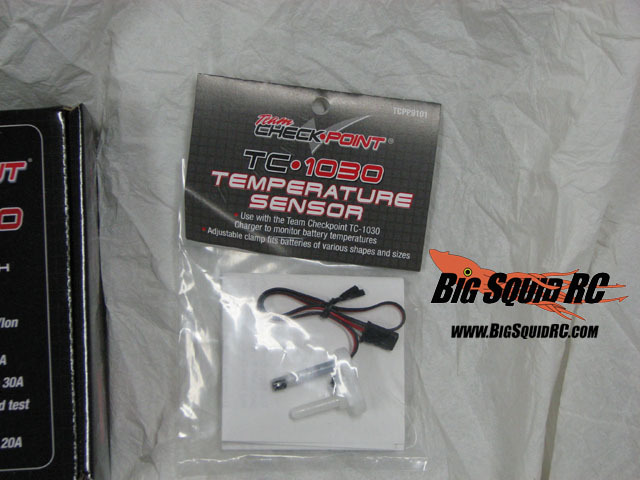 Also seen in these pictures is the TC1030 Temperature Sensor. This does not come with the charger, but for about $10 more, I highly recommend picking one up! This would of saved several battery packs, and I regret not owning one earlier. Lets talk features shall we? First off, the LCD screen is backlit! I have found myself more then once outside in the evening, or in a shaded area, and having this option is great! You can turn on or off the light to save on battery power if you are on the go. It has 10 customizable battery memory presets. These are very useful, and save a lot of time. I have a slot for receiver packs, 2-3 for stick packs, and 3 for my LiPo’s! This way I don’t waste time setting cell counts and mAh settings, I just pick the preset and charge! The charger has graphing abilities to easily monitor charging, discharging, or other functions where a graph will help understand what’s happening. It also has three motor break-in functions, a thermal cutoff option (using the temp sensor), adjustable audio tones for buttons, warnings, and options, twin cooling fans, banana plugs for supplying power to the charger that also come with alligator clips in case you are connecting directly to a battery, and lastly banana jacks for output to allow you to create many types of ready made connectors for all your types of batteries. While I must admit, that I do not use the motor break-in feature (if you were a electric racer type you would), I do use just about every other feature this charger has to offer! I love the ability to swap out my connectors quickly and be able to apply a charge to just about anything I need. I love the ability to store 10 presets for all of my battery types, and I am making sure that I use the thermal cutoff whenever possible. So, the TC1030 is the Swiss Army Knife of chargers, is there anything that it’s missing? Or things that could be improved? There are a few minor issues that I have. The temperature sensor does not easily fit all of my battery pack configurations. It seems like a pretty simple device, it would be nice to figure out a way to make it more versatile. For the price, I would like to see it come with some sort of wall plug option. I know that the lack of a power source is saving some $$, but I really think to easily get this into the hands of the bashers, not having to own a separate power supply would be great. Don’t get me wrong, I love the banana plug inputs, and being able to connect it to my battery when I’m on the road, but it would be great to use it at home without having to have a $80 power supply. Lastly, the temperature sensor is such a must own, it would be nice of them to include it in the box for the cost. The charger is everything it promises to be, and more! There are so many customizable options it’s amazing. 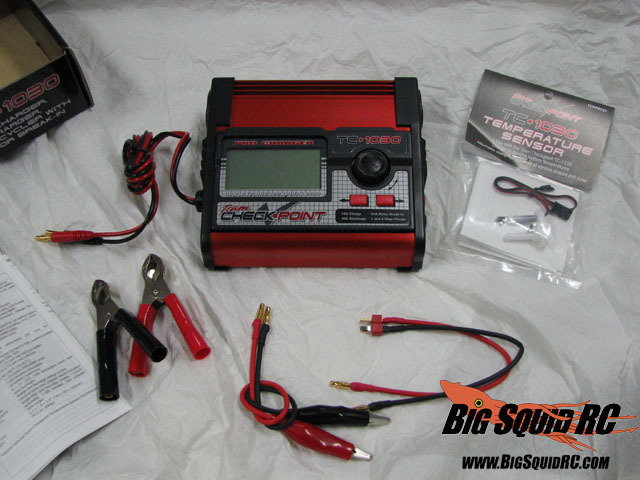 It’s a great charger for bashers on the run, and a dream charger for those that love their battery packs, and the ability to tweak every little setting for optimal battery performance! The manual is very informative, and does a good job of getting you used to all the adjustables step by step. It does a nice job of covering many of the advanced options that some people won’t even use, but if you are looking to step up your battery skills, it’s a good place to start. Where do they go from here? There really isn’t anything I could add to the charger short of some type of USB programmable option. Imagine being able to adjust everything from your PC, or having the ability to download presets that people think are optimal for certain packs. Is this necessary? No… but I can dream right? 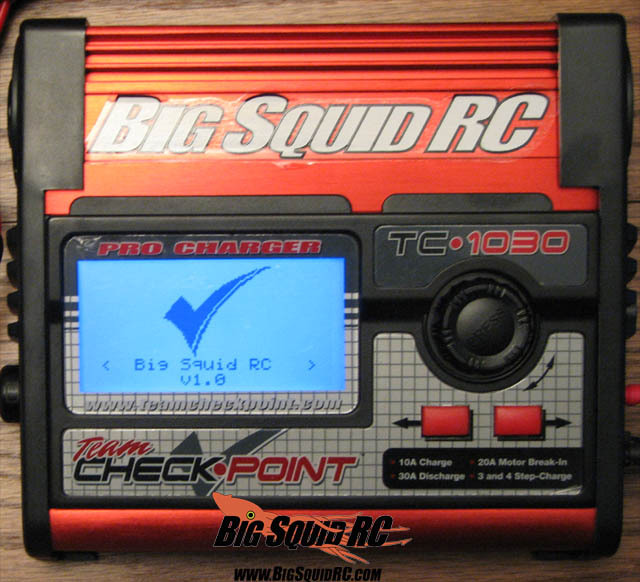 To wrap things up, the TC1030 is awesome! From the inputs and outputs, to the custom presets and backlit display and motor break-in tools, it’s everything you would ever want in a charger! If you are in the market for a new charger, don’t pass this one up! Like with all our stuff, if you see us at the track, or an event, feel free to stop by and check it out! Time to Bash 9/10 Pretty Quick. You’ll need a power supply, and take the time to use the presets! Workability 10/10 Adjustability, Customizable, and backlit-able! Car Show Rating 10/10 It looks good, the menus are great, and it’s backlit! 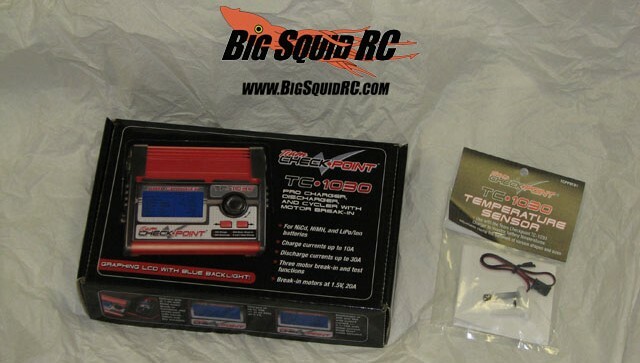 Big Squid Rating 9.5/10 Tentacles. It’s a little pricey, but it does it all!